In the years since the publication of First, Break All the Rules and Now, Discover Your Strengths, millions have come to the simple but powerful realization that to get the most out of people, you must build on their strengths. And yet, as Marcus Buckingham astutely points out, though the strengths-based approach is now conventional wisdom, the tools and systems inside organizationsperformance appraisals, training programs, and succession planning systemsremain stubbornly remedial and exclusively focused on measuring skills, finding gaps, and attempting to plug them. It’s a crisis for individuals and organizations, with management ideas and everyday practice utterly out of sync. That’s about to change. 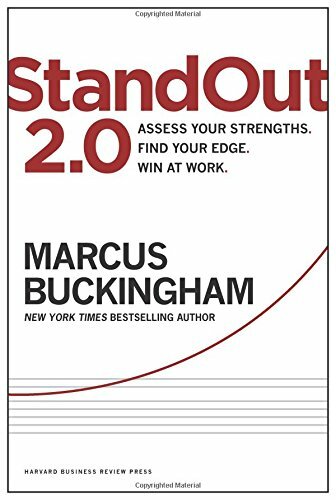 StandOut 2.0 is a revolutionary book and tool that enables you to identify your strengths, and those of your team, and act on them. The original edition of StandOut provided top-notch insights from one of the world’s foremost authorities on strengths, as well as access to a powerful, cutting-edge online assessment tool. StandOut 2.0 also includes the assessment and a robust report on your most dominant strengths. The report is easily exported so you can use it to present the very best of yourself to your team and your company. StandOut 2.0 is your indispensable guide for building on your strengths to further your careerand help your team and organization win.